Filipino revolutionaries in |formation. Image extracted from the book "History and Description of Picturesque Philippines. Colorized courtesy of Algorithmia. This article concludes the series we have been running on Batangas History regarding how the United States Army and Volunteers operated in the province during the Philippine-American War. The details are taken from a 1902 annual report of the United States War Department1. All the previous installments are archived at the Fil-American War section of the main menu at the top of this page. In the previous installment, we already started to see a continuing spate of Filipino revolutionaries surrendering to the Americans up to mid-March of 1902. This trend would continue in this final installment which would, among others, include the surrender of General Miguel Malvar himself. 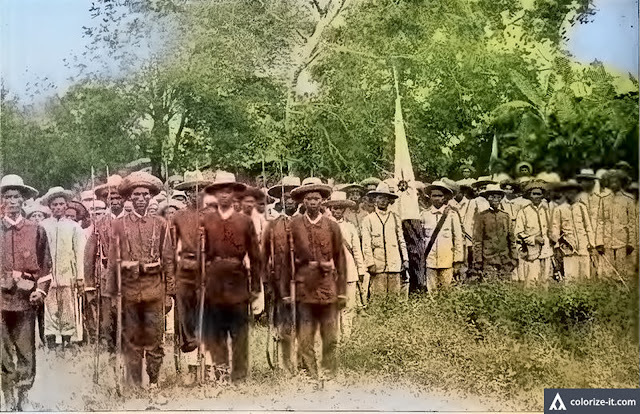 A Filipino revolutionary named Captain Hugo Sayat of the 6th Company, Tiaong Column surrendered at San Juan de Bocboc with six of his soldiers and 5 rifles, 6 shotguns, 2 bolos and 67 cartridges. Tomas Ruedes, presumably an officer of the Filipino rebels, surrendered also at San Juan de Bocboc. With him was one lieutenant and 20 soldiers, along with 9 rifles, 1 revolver, 10 war bolos and 60 cartridges. In the town of Batangas, two captains, one lieutenant and 26 of their soldiers surrendered to the Americans. They brought with them 10 Remingtons, 3 Mausers, 2 Ambergs2, 6 revolvers, 71 war bolos and 478 rounds of ammunition. Near the town of Rosario, Major Domingo Maratija (likely Martija) and Lieutenant Braga of the Filipino rebels were captured by Sergeant Owen Learson and Blacksmith William Buwalda of the 1st Cavalry. This was considered an “important” catch by the United States Army. A detachment of native (i.e. Filipino) scouts of the 1st Company under the command of one 1st Lieutenant Frank Nickerson, operating from the town of Tanauan, engaged Filipino rebels in Santa Clara, presumably in the neighboring town of Santo Tomas. Two rebels were killed, while rebel officers 2nd Lieutenant Edmedio Galtalo of Colonel Domingo Ramos’ Command was wounded and captured. Also located was a sizeable amount of rice, enough to load 150 ponies. Three detachments of eight men each belonging to the 11th Company of the Macabebe Scouts captured the band of ladrones, as the Americans called them, of one Captain Ramon in the mountains of Calaca. One of ladrones was killed while another 4 were captured. Taken from them were 3 shotguns, 1 war bolo, 72 Remington ball cartridges, 4 khaki uniforms, 7 insurgent uniforms and 8 caches of rice with about 40 cavans in each. There were no casualties on the part of the Macabebes. At San Juan de Bocboc, two soldiers of Captain Marcas (likely Marcos) Magundayao of the Martinez Column surrendered to the Americans, bringing with them one Mauser, one Remington and 59 rounds of cartridges. Still at San Juan de Bocboc, one lieutenant and three soldiers of the Taysan Column surrendered to the Americans, bringing with them 4 Remington rifles, 1 revolver and 100 cartridges. A detachment of scouts under the command of one 2nd Lieutenant Francis M. Boon encountered Filipino rebels near Poulouse3 in Batangas. One of the rebels was killed. On the part of the United States Army, one Philippine Scout was wounded. In the town of Ibaan, Lieutenants Severo Reyes and Mariano Leydo, with one sergeant and one corporal surrendered to the Americans, bringing with them 3 rifles, 1 revolver and 118 rounds of ammunition. 1st Lieutenant Samuel A. Price of the 28th Infantry received their surrender. In the town of Batangas, 16 officers and 24 soldiers belonging to the Santo Tomas Column of the Filipino rebels surrendered to the Americans. Filipino rebels Comandante Fernando Garcia, Captain Ilabio Africa and one Sargento Mateo of the 2nd Company operating in Taysan were reported captured by an American detachment under the command of one Captain Frank Tompkins. A party of United States Army Scouts under the command of one McCoy came upon a group of some 20 Filipino rebels near the town of Santo Tomas. They killed one of the rebels. In the town of Santo Tomas, members of the Santo Tomas Command under Comandante Pilapil surrendered to the Americans. Pilapil brought with him Captain Pedro Hernandez, 1st Lieutenant Marciano Manto, 2nd Lieutenant Cristen de Nosta, Partolene Malayba, Candido Guevarra and some 23 soldiers. Also surrendered were 8 Remingtons, 5 Ambergs, 1 revolver and 285 rounds of ammunition. In Ibaan, Lieutenant Wenceslao Basor of Captain Baristo’s band surrendered to the Americans. General Miguel Malvar surrendered to General J. Franklin Bell in the town of Lipa. His surrender for all intents and purposes ended the Philippine-American War. Through the rest of April and on to May, the annual report enumerated more rebels surrendering as, obviously, there was no point carrying on the fight with the leading general already having thrown in the towel, in a manner of speaking. There were pockets of resistance in Batangas, Cavite, Laguna and Tayabas even after the Philippine-American War had officially concluded, but these rebels lived practically as outlaws and were branded as ladrones or brigands by the American colonial government. 2 Another type of rifle. “Amberg Arsenal Model 71 84 Bolt Action Rifle,” online at NRA Museums. 3 Batangas History is unable to determine what locality this is in the present day.